Former Bay Area artist Sono Osato opens an exhibition of new work at Brian Gross Fine Art on Thursday, April 3, with a reception for the artist from 5:30-7:30pm. Contrasting with Osato's first show at Brian Gross Fine Art which emphasized painting, this show will include more of her intricately worked found object assemblages in addition to her richly layered encaustic paintings and wall sculpture. The show will present two oil paintings, one a major work comprised of four panels, the other a smaller related work, both of which reveal a palpable physicality through Osato's signature technique of painting thickly with oil and wax. Through her intuitive embedding of text in the form of typewriter and computer parts, Osato creates richly worked, textural, multi-layered surfaces. The exhibition will also feature an installation of assemblages from her "Cypher" Series. 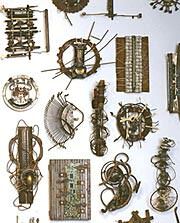 Made from recovered typewriter and computer parts, metal, wood, and bone, the echoes of text resonate in these pieces resulting in dense and richly detailed works laden with meaning. Sono Osato was born in Baden Baden, Germany, in 1960. She received her BFA from Arizona State University, Tempe and her MFA from the California College of Arts and Crafts, Oakland. Osato's work has been featured in exhibitions throughout the Bay Area including the San Jose State University Thompson Gallery; the San Jose Institute for Contemporary Art; The Oakland Museum; and the Center for the Arts at Yerba Buena Gardens, San Francisco, among others. She was a recipient of the Pollock-Krasner Foundation grant in 1989 and in 1999. She currently lives and works in New York City. The exhibition continues through May 17, 2003.